Just In: Supreme Court strikes out Ali Modu Sheriff’s application – Royal Times of Nigeria. 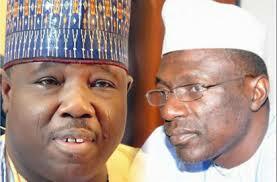 The Supreme Court has dismissed an application filed by the Ali-Modu Sheriff-led faction of the Peoples Democratic Party, which prayed the court not to hear a motion by his challenger, Ahmed Makarfi. Senator Sheriff had asked the court to refuse hearing on the application filed by Mr. Makarfi, challenging the February 17 judgement of the Appeal Court in Port Harcourt which made Mr. Sheriff leader of the PDP. Mr. Olujimi prayed the court to dismiss the application. Responding, Mr. Makarfi’s lawyer, Wole Olanikpekun, prayed the court to disregard the argument of Mr. Olujimi, describing them as baseless. In a short ruling on the application, a five-member panel led by the Chief Justice of Nigeria, Walter Onnoghen, said the application by Mr. Makarfi was considered valid since it complied with the rules of the Supreme Court. Mr. Onnoghen said according to the Supreme Court rules, an application challenging a decision of a lower court ought to have come within three months after the ruling of the lower court. He said the apex court had taken note of the fact that the case was decided at the lower court in February, while the motion at the Supreme Court was filed less than three months after the ruling by the lower court. He therefore gave a unanimous ruling in favour of the Makarfi faction, and awarded an unstated cost against the faction led by Mr. Sheriff.